The CP2104 does offer some extra pins that could be used for e.g. bit-banging, but I have never needed to use them for anything, so I do not know how easy they are to make use of. I thonk some Silabs adapters have GPIO and I2C in addition to serial ports. CH341A is what you want. BTW, wasn’t one of the good things about Chinese FTDI clones that they had implemented the bitbanging correctly, while real FTDI chips didn’t? May be that the clones worked better than the originals was one of the reasons FTDI deliberately released a MS autoupdate for the malware drivers to brick all the competition clone chips. Fortunately the linux version attempt at the same dirty trick was laught at and rejected. That also showed, that a mass produced, cheap microcontroller may be the better choice, compared to a (medium volume) custom chip. And that’s probably the reason, why Silicon Labs and Microchip sell factory programmed microcontrollers as USB to serial/parallel converters. I would say that if you want to build a device that works and keeps working even after a driver update, steer clear of FTDI in general. You never know what new trick they will invent next to brick your device. It is the same with Prolific chipsets too. But use a microcontroller instead. Why bother these less capable specialty devices? You can get cheap microcontrollers, well-supported microcontrollers like Teensy devboards, or built-in microcontrollers like the PRUs on the BeagleBone. Lots of better options. As long as you have the real FTDI chip in your design, it will continue to work, no matter how many driver updates. You will only run into problems if you buy fakes. But if you buy fakes, you might run into a lot of issues. They might work… or fail under certain conditions… or might be unable to handle high baud rates. 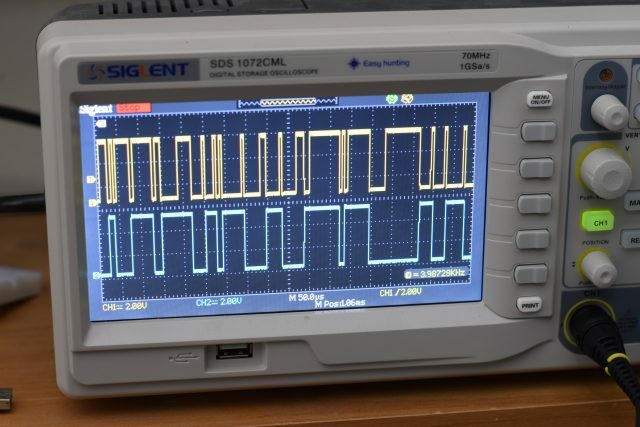 You shouldn’t complain about FTDI, you should complain about people making and selling fakes. Just write a small–and very fast, by the way–bit-banging routine in assembly language. The Radio Shack Color Computer used software as a UART for the serial port, though you could buy a serial board. I ran Microware OS-9 on it, multitasking and multi-user. But when I was printing something, the timing meant the software UART had to turn off interrupts a lot, which slowed down other things. So if I was printing, word processing in another window would slow to a crawl, suddenly you’d see the cursor moving about the screen ever so slowly. Hardware UARTs are the way to go. A few comments have recommended chips that have bit-bang mode, but I don’t see anyone sharing tales of what they use it for. Surely there must be use cases out there? I’ve been trying to think of a place where I would have used bit banging if I had it but can’t really think of one. I have a Bus Pirate that I often use to test out new chips to ensure I understand the protocol before using them in a larger system. But that’s usually SPI or I2C and so that’s what Scott Harden is doing here with the FTDI chip (and Bus Pirate has a bitbang mode so that’s another solution to add to the list of chips). Anyone have a non-standard protocol they bit bang? My L-Star project uses a Propeller to bitbang a 6502 but because that takes up a lot of pins on the Propeller, it’s difficult to emulate some old computers because I simply run out of pins. My design uses an FTDI based Prop plug to communicate between the PC (needed to program the Propeller) and the project, but I’m thinking of replacing it with a PIC that has a USB interface and extra bitbang-capable pins. That way I can free up pins from the Propeller to emulate more computers. It’ll have to be a PIC though: FTDI still doesn’t make their chips in DIP format and I want to keep my design 100% through hole. We bitbang SWD to enable our main CPU to erase, reflash, reset etc a secondary MCU/radio-chip (an nRF52xx). For both production test, factory programming and subsequent field updates. Nice! Are you actually sending the new firmware over SWD? Does the main CPU do error checking as it goes? Avrdude has long supported bit-banged serial programming, and it even works with the cheap PL2303hx clones if you break out the pins. Since you can pick up a USBasp for <150c now, there's little reason to bit-bang a USB-ttl adapter. However it could be useful in a pinch if you don't have a USBasp on hand. Those cp2102 based breakout boards have most of the pins exposed on the board. But I am pretty sure you could bitbang them faster with some libusb messages. There are many hardware alternatives, e.g. WCH chips (like CH340), not clones: https://www.eevblog.com/forum/reviews/alternatives-to-ftdi-usb-to-uart-converter/msg540847/#msg540847 or software alternatives, e.g. the CDC driver for Atmel MCUs. These alternatives can be orders of magnitude cheaper than FT232. I once used their ‘new’ VNC2 USB micro for a production test fixture. Turned out all our problems were caused by their buggy SPI implementation. It’s really not that hard to get right (speaking as an ex digital IC designer) but that issue killed the project and I never touched those parts again. Why not consider the Exar XR22802? It has a very low latency HID interface, which works fine under Linux. The ethernet driver can be disabled in firmware to reduce power consumption. We used the MCP2210 in the past, which is slow. FTDI chipsets were not considered because of their custom linux drivers. Seems like a cool device, but apparently it costs about 7$ in low quantities. Maybe the dumbest one if you need to control timing from something that runs a real opsys (linux, pi, PC, MAC) that won’t bitbang- I just use an arduino, the chinesium sort, dirt cheap and realtime as I wish with my little cooperative multitasking system (which is less fancy than the name). OK, it’s big, but I’m doing infrastructure stuff anyway. I used to be a super PIC fan and designed them into product for myself and others, but Arduino is just a no-brainer anymore. ~~$4 and 30 minutes tops with a bog standard USB to talk to the host in the host’s timing while I do realtime in the Atmel? Beat that and I’m listening. What is this Analog Devices chip of which you speak? You mean an AD9850?